I snapped a few of the product I'm loving at the moment, while the sun was busy shining through my window. I can't stop lighting my Le Labo Santal 26 candle, it may just be my favourite smell of all time. Jo Malone Earl Grey and Cucumber comes a close second and I've been wearing this fresh scent every day. 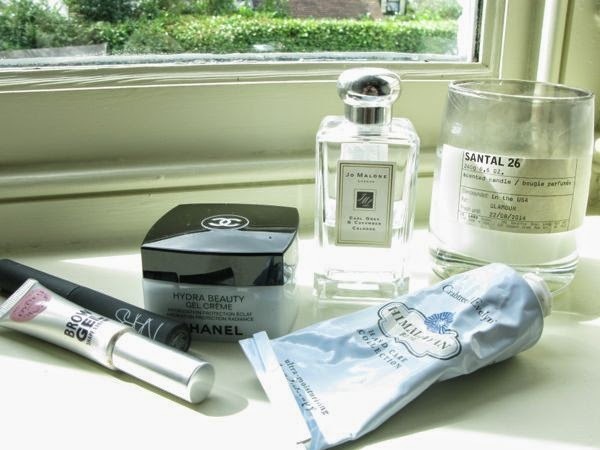 Chanel's Hydra Beauty Gel Creme is the perfect antidote to tired winter skin, as is my Crabtree and Evelyn hand cream (Grandma Joyce's favourite) which I'm lathering on at every given opportunity. Along with my essential NARS black mascara, this Eyeko brow gel was given to me by a make-up artist who was doing my make-up for a shoot recently - and now I can't live without it.